I’ve been reporting and writing for SearchHealthIT for about three years and the day has come for me to say goodbye. 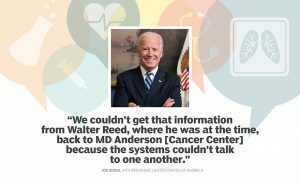 After all these experiences, I wanted to tell you about the top three healthcare stories I reported on during my time as a health IT reporter that I will never forget. If you have anything to do with health IT, then chances are you know who John Halamka is. Shortly after I began writing for SearchHealthIT and learned that Halamka, the CIO of the Beth Israel Deaconess Medical Center (BIDMC), is a health IT superstar, as some have called him, I decided I wanted to try to do a video interview with him. I ended up getting way more than I asked for. In addition to an hour long video interview in his office at BIDMC where we discussed topics ranging from his wife’s battle with cancer to telemedicine to data sharing, he let me visit his farm in Sherborn, Mass. One of the videos that came from this adventure with Halamka, a video about the technology he used to help cure his wife of cancer, would end up winning several awards. Just seeing the then-Vice President of the United States was an honor. But to hear him discuss the very personal story of how data blocking affected the ability for his son, Beau, to receive care humanized him and tapped into something I was already very passionate about. The topic of data blocking has always fascinated me as a health IT reporter and it was always a very slippery subject to really nail down with concrete evidence. Healthcare professionals will discuss the data blocking issues they’ve experienced but no one will really name names. So to have someone like Biden publicly discuss his experience and acknowledge that it’s happening (there really is no denying it is happening) was a powerful moment for me. There’s something special about being allowed to visit a healthcare organization, to sit down with the CIO, and to discuss health IT issues at length. It is something that has definitely enriched the healthcare stories I’ve written. But to be welcomed at Massachusetts General Hospital (MGH) – video camera in hand — and have the opportunity to discuss with MGH’s CIO, Keith Jennings, MGH’s experience implementing Epic – a $1.2 billion project – is something I won’t soon forget. Everyone in healthcare can relate to the challenges that come with implementing an EHR. After all, you’re all required to do it! But MGH’s implementation of Epic was a huge project and Jennings was open about discussing the challenges and lessons learned from that experience. It’s been my honor to tell these healthcare stories and I’m grateful for all the amazing people I’ve met and interviewed along the way. Make sure to visit SearchHealthIT for more health IT articles, podcasts, videos, and more!